Our latest public art initiative is our largest yet – literally and figuratively. 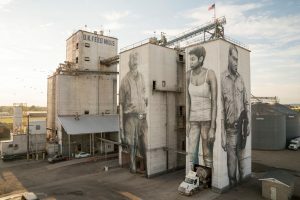 This fall, Australian artist Guido van Helten will create a one of his larger-than-life murals on the Ardent Mills silos in City Center Mankato’s Old Town District, right in the heart of the downtown. The Ardent Mills silos are the gateway into our community, and this project will use art to tell the story of Greater Mankato: that we are a thriving community with a rich heritage, a thriving present and unlimited potential for our future. We need your help to make this project a reality! Thanks to generous pledges, we have raised more than 75% of our $250,000 goal. We need to reach out fundraising goal by April 1 – can you help? $5,000+: enhanced listing/logo on the donor plaque, and commemorative SiloArt coffee table book with professional photographs of the artist’s process, installation and completed mural. Donors at any level will be invited to attend an artist meet and greet during the installation of the artwork. Guido Van Helten is an internationally recognized artist creating contemporary street art throughout the world which is underpinned by his exploration of community and identity generated through photography and large-scale mural installations. Born in Canberra and growing up in inner city Melbourne, Australia, the artist was influenced at a young age by traditional graffiti movements, leading to an introduction to aerosol at a young age. After graduating with a Bachelor of Visual Arts in Printmaking at Southern Cross University, Guido began the development of his contemporary work, now closely aligned with the movement of large-scale muralism across the world. 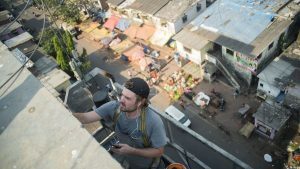 His work has developed out of his keen interests in travel, photography, architecture and learning about cultures in connection with their landscapes. Receiving attention for his work in regional communities around Australia, Guido was nominated for the Sir John Sulman prize at the Art Gallery of NSW in 2016 for his work in the community of Brim, Victoria. These interests and his ability to work on large-scale projects have spurred commissions across the world throughout Europe, Scandanavia, the United States and Australia.